The Palestinian Authority’s arrest of prominent human rights activist Issa Amro is part of a wider crackdown on critics of Mahmoud Abbas’ rule, says Ali Abunimah of The Electronic Intifada. AARON MATE: It’s The Real News. I’m Aaron Maté. The Palestinian Authority has released a prominent human rights activist following a global outcry. Issa Amro was detained last week for criticizing a Palestinian Authority crackdown on journalists. After the PA raided and shut down a radio station, Amro urged it to respect free speech. His arrest drew international criticism that grew as Amro staged a hunger strike behind bars. The case is seen as part of a wider crackdown on Palestinian media and dissent inside the occupied territories. Ali Abunimah is co-founder of The Electronic Intifada, and his latest book is The Battle for Justice in Palestine. Ali, welcome. AARON MATE: Thanks for joining us. You have a piece up on your website tracing this arrest in the context of what you call a “wider crackdown on free speech inside the territories.” Can you explain for us what happened here? ALI ABUNIMAH: Yeah. Issa Amro, as you said, is a well-known human rights defender in the occupied West Bank city of Hebron. He is a founder of a group called Youth Against Settlements. The work they do is critically important because Hebron is ground zero for some of the most extreme and fanatical Israeli settlements placed in the middle of this Palestinian city of 100,000 by the Israeli government and protected by the Israeli Army.Issa Amro, before his arrest by the Palestinian Authority last week, was already facing a so-called military trial by Israel on trumped up charges, which are clearly aimed at suppressing his work against the settlements. It’s such a ludicrous trial that even 32 members of Congress were prepared to sign a letter supporting him against this Israeli military kangaroo court. As if that’s not bad enough, last week the Preventive Security of the Palestinian Authority arrested him after he made comments on Facebook criticizing the arrest of Ayman al-Qawasmi, who is the head of Minbar al-Hurriya, a popular radio station in Hebron. Now, you may ask me, why was Ayman al-Qawasmi arrested by the Palestinian Authority? Well, the reason was a few days before his arrest, Israeli occupation forces raided his radio station, caused an immense amount of damage, confiscated equipment, and ordered the radio station closed for six months. And Ayman al-Qawasmi expressed frustration that Israeli occupation forces were doing all this, and the Palestinian Authority was doing nothing to defend Palestinians against these regular Israeli attacks. So he got picked up by Palestinian Authority security as well. AARON MATE: Now, al-Qawasmi, didn’t he also call for Abbas to resign in that post that he released expressing his frustration? ALI ABUNIMAH: I don’t know if he did or didn’t call for him to resign, but from what I saw of his comments, he was simply expressing his opinion. He would certainly have the right to call for Abbas to resign. In any case, Abbas’ electoral term expired many years ago, so I’m not sure what he would resign from since formally he doesn’t have a position anymore. It expired. But Ayman al-Qawasmi’s arrest was criticized by the Committee to Protect Journalists, as was the Israeli shutdown of his radio station.But note what’s going on in both of these cases of Issa Amro and Ayman al-Qawasmi is that you have Israeli occupation forces and the Palestinian Authority working hand in glove. Israel and the Palestinian Authority are going after both of these individuals because of their work and because of their opinion. This is part of a much wider and harsher crackdown by the Palestinian Authority. It’s been going on for years of course, but it has intensified in recent months.Just in July, Mahmoud Abbas, the head of the Palestinian Authority, issued a decree, the so-called “Electronic Crimes Law,” which is a draconian measure limiting what Palestinians can say online. So now we have both the Palestinian Authority and Israel routinely arresting and harassing Palestinians just for opinions they express on Facebook. The Electronic Crimes Law has already been used to arrest and harass journalists by the Palestinian Authority.So this is part of a wider crackdown. According to MADA, a Palestinian press freedoms group, dozens of journalists were arrested in the past few weeks. In fact, at this point, the Palestinian Authority is arresting even more Palestinian journalists than Israel. AARON MATE: Right. Ali, if you can talk about this in the context of something you touched on a little bit, which is the political reality for Mahmoud Abbas. In power for a long time. Way past his mandate, as you said. Deeply unpopular. Increasingly reliant on Israel and the U.S., who have in turn of course offered him nothing, especially under President Trump and his envoy Jared Kushner. In terms of Abbas turning to crackdown on dissent against him in the face of so much discontent with his rule. ALI ABUNIMAH: Yeah. It’s exactly that. The whole premise of the Palestinian Authority was that it was supposed to be temporary, while negotiations were going on, until there would be a final settlement. And the whole regime of a Palestinian Authority working hand in glove with the Israeli occupation was supposed to be a transitional measure for five years. Those five years ended in the late 1990s, and we’re now almost 25 years since the Oslo Accords between Israel and the PLO were signed. And what we have in effect is a permanent status of a non-independent Palestinian Authority that functions as the subcontractor of Israeli occupation.The name for this is security coordination. That’s a polite name for collaboration, the Palestinian Authority acting as Israel’s native enforcer and native repressor of any form of Palestinian resistance to the Israel occupation. Significantly, the entity that arrested Issa Amro is the so-called Preventive Security. This is an entity that works closely, and one of the many intelligence services that the Palestinian Authority has that works closely with the Israeli occupation.And one thing we know that human rights groups have documented in dozens of cases is that the Palestinian intelligence services work closely with Israel, and oftentimes Palestinians like Issa Amro will first be arrested and interrogated by the Palestinian Authority and then arrested by Israel. Some of those who’ve come out later have said that the Israeli interrogators actually had information that came to them from the Palestinian Authority.I’m not suggesting that’s the situation in Issa Amro’s case, but in other cases documented by human rights groups, there does seem to be this pattern where the Palestinian Authority will arrest people on behalf of Israel and then effectively hand over the information to Israeli agencies like the Shin Bet, which systematically torture Palestinians. So that’s security coordination.And it’s critical to note that this is all financed and supported principally by the United States and the European Union. The European Union gives the Palestinian Authority hundreds of millions of dollars a year. This is marketed and advertised as support for the Palestinian people, but it really needs to be seen as a form of subsidy to ongoing Israeli occupation. And it was notable, as far as I know, there was absolutely no criticism of the arrest of Issa Amro from the European Union, which of course loves to boast about how much it loves and supports human rights. AARON MATE: Finally, Ali, I’m wondering if you can talk about what all this says about the difficulties there are for Palestinians inside the territories in struggling for their freedom. 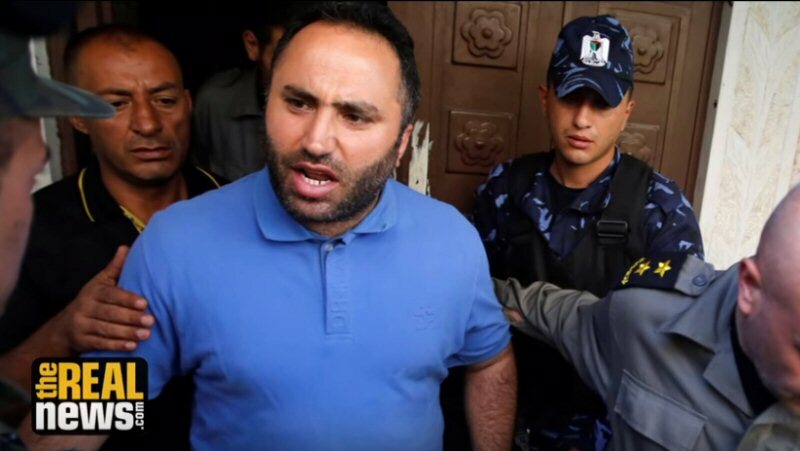 The case of Issa Amro illustrates he has to deal not just with being charged and detained by the Israeli occupation forces but also by the security forces of supposedly his own government, the Palestinian Authority, for ordinary Palestinian struggling for their rights facing these two forces inside their own territory. ALI ABUNIMAH: Yeah. He, like other Palestinians, is caught in a vice between these two forces, the Israeli occupation and the Palestinian Authority. But I think it’s really more accurate to call them one force because the Palestinian Authority is an extension of and a manifestation of the Israeli occupation, and I think this simply underscores the need for international solidarity.One of the good things about what happened is the large amount of international solidarity that Issa Amro received. I mentioned that 32 members of Congress, which is pretty remarkable, signed the letter in his support in June because of the trumped up Israeli charges against him. And nine members of Congress signed a letter urging Abbas to release him. So I think that the high profile, the international attention to his case will certainly help protect him from these two hands or two fists of the occupation, Israel on the one hand and the Palestinian Authority on the other.But I think it underscores also the need for increased international solidarity and pressure to finally end this occupation and all forms of Israeli violations of Palestinian rights, including Palestinians in Israel and Palestinian refugees who of course are denied their right to return, and also not to limit our analysis to what is happening in the occupied territories. Just today, for example, Israeli media revealed that the Israeli government is planning to punish the Israeli section of Amnesty International for calling for an international ban on Israeli settlement goods by taking away their tax exempt status, and that would presumably, or Israel would hope, make it harder for them to raise money and to defend human rights.That just shows that Israel’s willingness to attack human rights defenders has no borders. It’s not limited to the West Bank. Palestinians are the first targets of Israeli repression, but Israelis and others who speak out against this and call for accountability are being targeted, too. That’s why Palestinian civil society have called for a comprehensive South-Africa-style boycott of Israel because you can’t draw a line really between Israel and the occupation in the West Bank. It is all one system of apartheid as the UN report that was released in March said. Of course, that UN report famously suppressed under US pressure by the UN Secretary-General I think hours after it was published. But those realities are visible to people, which is why Israel is working so hard to silence voices like Issa Amro that have been effectively getting the message out. AARON MATE: We have to leave it there. Ali Abunimah, co-founder of The Electronic Intifada. His latest book, The Battle for Justice in Palestine. Ali, thank you.